We offer mounts for most popular ex-military rifles with no drilling or tapping, in addition we have a wide selection of customized bases for most sport rifles, and we manufacture level light bow sights. We also sell a wide selection of NC Star Scopes. We are on Facebook! Come check us out there! Every sportsman needs at least one perfect scope mount. 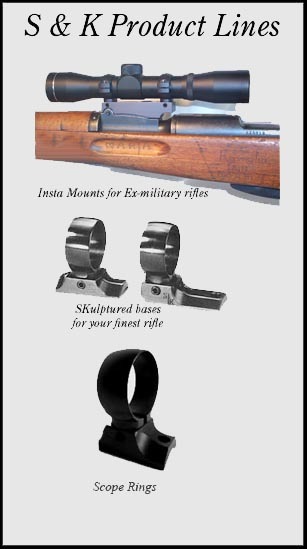 S&K claims: "World's Strongest Scope Mounts"
your favorite rifle using your favorite S&K mount. All S&K products are fully guaranteed. If you are dissatisfied with an S&K product for any reason, simply return the unaltered product to us within 30 days for a complete refund (or through original place of sale if bought elsewhere). We guarantee each S&K product to be free of defects in material and workmanship for life or your money back. Any exchanges may be made directly with us. Lost or broken parts may be obtained by returning the broken part or description directly to us for replacement. 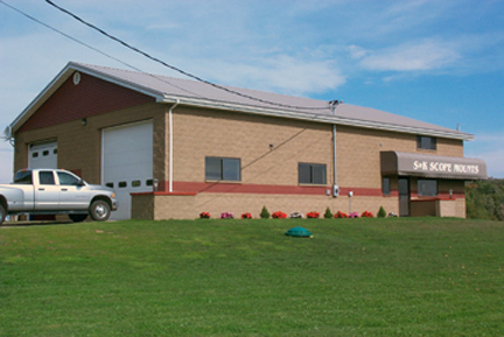 S & K Scope Mounts is located in rural Warren County, PA where the hunting tradition is as old as the forests that occupy the majority of the land area here. Our forests support plentiful game animals such as the popular white-tailed deer, wild turkey and black bear. S & K Scope Mounts was founded in 1964 by Sid Haight who saw the need then for a high quality scope mount to meet specific needs. Today, under the management of Bryan Labowski S&K continues to provide the quality services and products envisioned by the company's founder. We are dedicated to the idea of leading the industry in innovative design, quality construction and dedicated service to the customer. S & K Scope Mounts wishes to thank you, the customer, for 35+ years of acceptance and hope to serve you now and in the future. A word about our company: we at S&K do everything possible to keep our prices low and value high. However, we have placed limits on potential manufacturing cost savers. We use top-grade virgin metal and machine them here in our USA (Pennsylvania) plant to finish specs. If you want castings, extrusions, plastics, or sintered metal scope mounts, buy elsewhere. We do resort, however, to other cost savings. Our generic packaging is not attractive but is inexpensive. After all, do you want a nice package or do you want the best scope mount available? Our advertising is not the most extensive or expensive -- we rely heavily upon word of mouth, and that is precisely why we want YOU to be a satisfied customer.